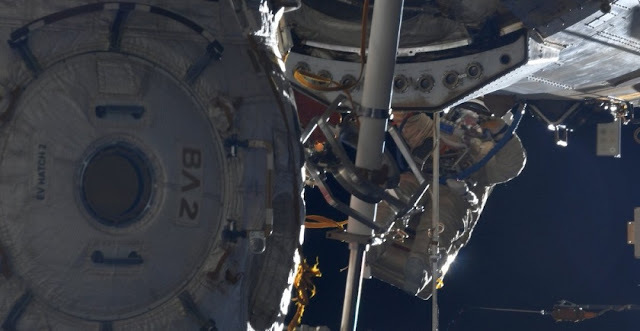 In the second spacewalk of 2018, two Russian cosmonauts went outside the International Space Station to upgrade an electronics box on the Lira high-gain antenna at the aft end of the outpost. Expedition 54 cosmonauts Alexander Misurkin and Anton Shkaplerov opened the airlock hatch on the Pirs docking compartment at 10:34 a.m. EST (15:34 GMT) Feb. 2, 2018, officially starting the outing. The spacewalk was anticipated to last about 6.5 hours. While that may have been a light joke, the planned outing indeed went into overtime after an obsolete rendezvous target caused a snag in the eventual redeployment of the Lira antenna. In total, the outing lasted 8 hours, 7 minutes—the longest Russian spacewalk and fifth-longest in human spaceflight history, according to NASA. Once the duo left Pirs, their first task was to gather tools and equipment and bring everything to the rear of the space station—the aft portion of Zvezda. This took around an hour. The next step was unlock the Lira antenna to move it into a stowed position to access the electronics box that will be replaced. The orientation placed it in front of the currently-empty aft docking port. The port will host Progress MS-08 after it launches on Feb. 11, 2018. Replacing the high-gain receiver involved removing screws and connectors that were not designed to be worked on in space. According to NASASpaceflight, in planning for the spacewalk, tools had to be invited in order to do the complex work outside the outpost. According to Spaceflight101, Lira has actually been mostly dormant since it launched with Zvezda in 2000. It was supposed to communicate with the Russian Luch Satellite Data Relay Network, which is similar to NASA’s Tracking and Data Relay Satellite System, to allow for near-continuous communication with Russian mission control in Moscow via a space-to-space network. However, delays and degradation prevented prevented Lira from being used for that purpose. Luch is now operational with new satellites launched between 2009 and 2014. As a result, the now-outdated hardware inside Lira had to be upgraded in order to be compatible. About four hours into the spacewalk, the cosmonauts finally finished detaching the old electronics box and disposed of it by throwing it away from the outpost. It was pushed away retrograde in relation to the orbital path of the outpost as to ensure the box does not come around it strike the outpost in the near future. The Lira electronics box won’t be in orbit for long as the slight drag of the upper atmosphere will begin to slow it down over the coming weeks and months before it eventually reenters and burns up. Once the old box was safely thrown away, the new one had to be installed in its place. That took a little over an hour. As soon as the modern-Luch-compatible high-gain receiver was confirmed to be activated, the cosmonauts were tasked with rotating Lira back to an operational position. However, there was a problem. The antenna got snagged on a now-unused docking target for the now-retired European Automated Transfer Vehicle. This resulted in the two cosmonauts manually moving the antenna around the docking target before commanding the antenna to move again. However, it moved further than planned—a full 180 degrees from where it was supposed to be. This will require further investigation from Russian ground controllers. Nevertheless, the spacewalk was already running long and it was time for the duo to clean up their work space and make their way back to Pirs. Hatch closure finally occurred at 6:47 p.m. EST (11:47 GMT), officially ending the record-breaking EVA. According to NASA, this was Misurkin’s fourth spacewalk and the second for Shkaplerov. Additionally, it was the 207th EVA in support of ISS assembly and maintenance since 1998. There will be another spacewalk at the ISS in the coming weeks. A U.S. orbital segment-based spacewalk is planned for Feb. 15, 2018, and will see NASA astronaut Mark Vande Hei and Japan Aerospace Exploration Agency astronaut Norishige Kanai stow and reposition two latching end effectors that were recently replaced on the robotic Canadarm2.